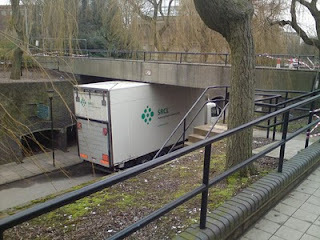 I spotted this lorry firmly wedged under a bridge when on my travels around the University of Birmingham campus this afternoon. Apparently it has been there for a while now (four days, I hear!). And the company logo on the side of the truck? ‘Protecting People. Reducing Risk’. Classic! 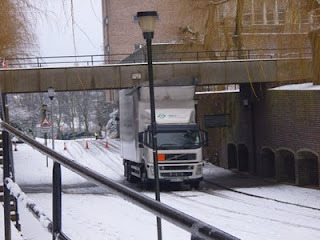 Yes, three weeks later and the lorry is STILL lodged under the bridge. Apparently it has caused serious structural damage to the bridge and a structural assessment of the damage has shown that the vehicle cannot be moved until the bridge structure is independently supported and made safe. There are plans to remove the lorry and provide temporary propping which will allow the road to be used soon. Work on the bridge will take place later in the year. So, lorry drivers out there, if there is something to be learned from this HGV faux-pas then it is this: LOOK UP!! !